Renting a dumpster from when you need to clear your house of junk is a great idea. 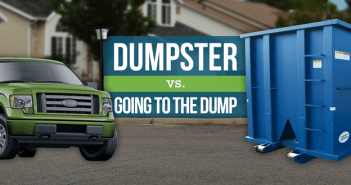 Unless you’re a contractor or do a lot of DIY or cleanup projects, you probably aren’t very familiar with the dumpster rental industry. That’s where we come in. Budget Dumpster has years in the business and we are here to help you every step of the way, from the minute you call in to the minute your dumpster is hauled away. Don’t hesitate to call Budget Dumpster at 866-284-6164 when you have any questions or want to set up a dumpster rental. Determine what size dumpster you will need for the amount of junk you want to get rid of. The most common size for household cleanouts is the 20 yarder. If you’re unsure, you can always call in and ask one of our sales reps. If you plan to have the dumpster go in your driveway, make sure it is long enough to accommodate the size of the dumpster. Most 20 yard dumpsters are approximately 20-22 feet long. If the length of your driveway cannot fit two cars without reaching the sidewalk or street, your driveway is likely not long enough to accommodate a dumpster. In this case, you could consider street placement as an alternative. It is also important to make sure you do not have anything overhanging that would block access to your driveway, such as low tree branches or wires. Start making a pile of all the items you want to get rid of. 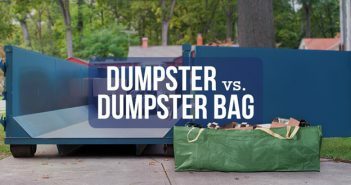 Even if you don’t get through everything, this will help give you a better idea of how much you really have to help you determine which size of dumpster you will need. Dumpsters are incredibly convenient and they lend you an opportunity to throw out all that old junk that you don’t want anymore. However, don’t go tossing anything and everything into the dumpster just because it’s there. Some materials are prohibited from going into the dumpster. Make sure you sort out those prohibited items so they don’t accidentally end up in the dumpster. (Items like tires can come with hefty fees if they end up at the landfill!) Prohibited items can vary by location. If you are unsure if an item is allowed to go in our dumpsters or not, ask one of our customer service representatives and they will be able to answer your questions. Make sure you know where you want the dumpster to go, and give that information to the sales rep when you call to place your order. Plan ahead, and make sure you’ll still be able to access everything you need once the dumpster is placed. Don’t request to put the dumpster right up against the garage if you have a vehicle directly on the other side of the garage door that you will need to use. Or, just make sure you have your cars out of the garage before the dumpster is delivered to your site. If we have to send someone out to move the dumpster after it has already been dropped off, you will incur an additional trip fee. Nobody wants to have that, so we’d rather do it right the first time! Driveway damage from a dumpster rental is extremely rare. Although very unlikely, nobody is perfect and it is a possibility. You can take extra precautions to protect your driveway from any potential damage. If you have plywood, you can lay that down on the driveway where the driveway will be placed. When the rare driveway damage does happen, it usually occurs during pickup when the weight of the dumpster is heavy and the truck has difficulty lifting the dumpster. If you are extra paranoid about damage to your driveway, you can always take the route of street placement. Note that placing a dumpster in the street does require a permit, but sometimes our sales reps can handle that for you. If you have any other questions, don’t hesitate to contact Budget Dumpster! Customer satisfaction is our number one priority and we will make sure everything is right with your order. I am doing a home remodel, and I am going to need to rent a dumpster to dispose of all of the debris. The suggestions you give to make sure that I prepare adequately for the dumpster were very helpful. Specifically, I like the suggestion you give to protect the area that the dumpster will be stored. I never thought about concrete damage, but laying down wood to put the dumpster on is a really great idea so that when we bring in or take out the dumpster it doesn’t ruin my driveway. Thanks for the great advice! I think getting one of these dumpsters would help me sleep at night. My wife is a well known hoarder, and we need to throw away a lot of stuff. Hopefully I can find out if she’s willing to do it before I rent the dumpster. Thanks for sharing all of this advice on preparing for a dumpster rental. Your tip on putting plywood on the driveway to protect from any damage is really nice. 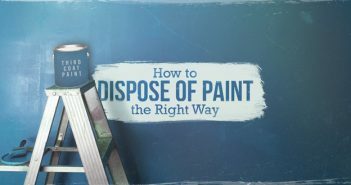 If you are taking the time to actually get a dumpster for heavy duty cleaning, then you need to be sure that everything goes as smoothly as possible. Plus, it is better to be safe rather than sorry! These are some great tips, and I appreciate your advice to sort out what you’re throwing out before you hire a rental dumpster. I’ve accumulated a lot of junk over the years, and my shop is a mess now. I’m planning on doing some serious cleaning soon, and I’ll be sure to make a garbage pile before renting a dumpster. Thanks for the great post! It seems like common sense hearing it, but I would not have thought to put plywood down before my dumpster rental came! Also, what sizes do they come in? Are there big ones and small ones? Anyway, I did not realize how much goes into a dumpster rental and I am glad you made it easy to understand with this article!